← Alternative Corvair Cooling, 1993. Old photo, circa summer of 1992. 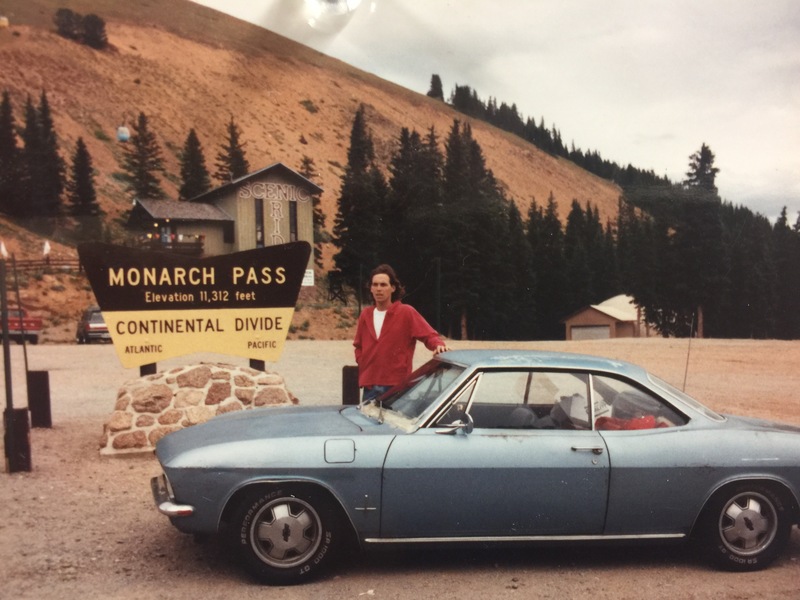 This was on an8,000 mile circumnavigation of the US in my 1967 Corvair Monza. It had a 110 HP engine and a 4 speed. The photo was taken at Monarch Pass in Colorado, 11,312′ above sea level. Above, where East meets West, the continental divide. When looking for another good flight motor core in 1991, I came across the car for sale in Daytona Beach. It was for sale buy the family of the original owner. The owner had been a Delta Airlines mechanic, but no one in his family was interested in ‘his old car.’ His son, who was into modified Japanese cars, had no interest in it, and offered it to me, two flats, a cracked windshield and not running, for $650. I changed the tires, and had it running in an hour. It only had 49K miles on it. I changed the o-rings and valve cover gaskets and it ceased to leak oil. I drove it as my sole car for 6 years. The only times it stopped running was a bad mechanical pump in Yosemite Valley ( fixed on the spot) and the previously mentioned failure of the 26 year old blower bearing. In 2003, the case was used as the original 2,775 cc engine in our Zenith 601XL. (2,775 cc Pistons are here.) 12 years later I used the same case to build this engine: 3,000cc Corvair (lower compression) engine, which is in my Wagabond today. Have you ever had contact with anyone involved in the R&D of the Corvair engine?This would probably floor them. Robin, I have other pictures, it rusted the floor pans and rear structure very badly, and I traded it on another 1967 corvair. More pictures later. Good story. Today I learned an old VW boneyard is going to the crusher. I need to run over and try to save the 67 corvair that I know is in there too.